For years I have proposed that the three top reasons most Protestants are not Catholics (besides pride) are (1) ignorance: they don't have the right data about the Catholic faith, (2) prejudice: the data they have is inaccurate, and (3) "bad Catholics": either the Catholics they know are poor models of the Catholic faith, or the faithful Catholics they know don't fit their definition of what it means to be a Christian. Reinforcing these three reasons is the fact that few non-Catholics read books about the Catholic Church written by faithful Catholics. I have decided to announce a Year of Faith. It will begin on 11 October 2012, the fiftieth anniversary of the opening of the Second Vatican Council, and it will end on the Solemnity of Our Lord Jesus Christ, Universal King, on 24 November 2013.... We want this Year to arouse in every believer the aspiration to profess the faith in fullness and with renewed conviction, with confidence and hope. It will also be a good opportunity to intensify the celebration of the faith in the liturgy. may this Year of Faith make our relationship with Christ the Lord increasingly firm, since only in Him is there the certitude for looking to the future and the guarantee of an authentic and lasting love. I hope that we are trying to understand what the Catholic Church teaches -- I should say what the Catholic Church really teaches. Often there is ignorance and misunderstanding. I think Bishop Sheen once remarked that, if he believed the same thing that most who left the Catholic Church believed, he himself would leave. He knew that there was a lot of misinformation about Church teachings. Not knowing Church doctrine is not knowing what Christ teaches. Without this knowledge we miss out on a lot; we miss out on beauty and happiness. 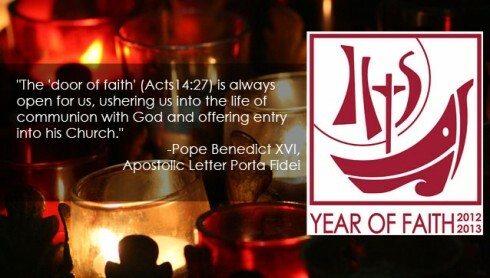 In this Year of Faith, if we have not yet, let us get down to business and start knowing Catechism better. But, a word of caution: there are many dissidents or self proclaimed know-it-alls who claim to explain Church teachings. But, they do not. Always go to a source you can trust, such as, www.vatican.va/archive/ENG0015/__P3S.HTM, and ewtn.com/index.asp?myselection=us, There Is also EWTN on TV and on satellite radio. Knowing the truth leads us to a more wonderful relationship with our Lord; may we all take advantage of this.